EMP: The Next Weapon of Mass Destruction? If America needs a new threat around which to organize its defenses, try this one: Bad guys explode nuclear weapons miles above U.S. soil, sending out an electromagnetic pulse (EMP) that fries the electronic guts of everything in America. The nation's financial and transportation systems collapse, hospitals and the Internet go dark, water and electrical grids freeze and runaway Toyotas with electronic throttles are finally brought to a stop. "The EMP resulting from the blast would cause widespread damage, devastating the economy and resulting in the deaths of millions of Americans," the hawkish Heritage Foundation warned last week, launching a call on Congress to establish an EMP Recognition Day. Maybe it's America's frontier heritage; moving west and constantly facing new bands of Indians, this nation has always seemed to have an exaggerated awareness of potential threats. The Cold War gave us warnings of missile and bomber gaps, later found to be largely mirages, that were supposedly leaving U.S. citizens vulnerable to Soviet attack. Fear of the supposed Soviet missile advantage spurred President Ronald Reagan's Star Wars initiative and the $100 billion Washington has spent preparing to counter incoming enemy missiles even as the Soviet Union disappeared. Then, 9/11 put us in the crosshairs of Islamic terrorists, calling into being a mushrooming homeland-security industrial complex. All very well, warn the sentinels at the Heritage Foundation, but what about the EMP threat? "Despite repeated warnings, Congress has taken virtually no action to prepare or protect against an EMP attack," write the Heritage Foundation's Jena Baker McNeill and James Jay Carafano. "In order to facilitate a national discussion regarding the EMP threat, Congress should establish March 23 as EMP Recognition Day"  not coincidentally, that's the date of Reagan's famous 1983 speech launching his missile-defense initiative. Leaving aside the contradiction of urging Congress to concentrate attention and resources on a threat that most in Washington consider an infinitesimal probability, the whole notion seems rooted in some visceral need for foes with diabolical destructive abilities. There's something almost pathetic about cowering in the shadow of such a threat, instead of shrugging it off with the resilience that was typical on the American frontier. To blunt the impact of an EMP strike, those most alarmed by the threat want the U.S. military to shield its key electronics, and want vital elements of civilian society to do the same. 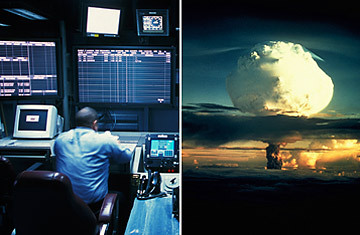 Like with taxes and health care, the debate over the EMP threat is polarizing. "More fearmongering to garner more $$$ for The Big War Machine," opines one poster on Wired's Danger Room blog. Another skeptic asks: "Do they have a flying carpet that could go that high?" But EMP-threat true believers won't be deterred. "Detonating a nuke on the ground would leave cities in shambles and radioactive for years to come," one points out. "If they had any plot to reuse the invaded land, they would most likely go for an EMP approach." Unfortunately, the Pentagon thinks a threat is a terrible thing to waste, so the Navy has begun studying how to protect its fleet from such an attack. "A nuclear device detonated at an altitude in excess of 40 miles generates High Altitude Electromagnetic Pulse (HEMP), which is the focus of the U.S. Navy program," a recent Pentagon report says. Doing nothing, it warns, poses a risk "at the highest level." Hemp and high? You can't say the Navy doesn't have a sense of humor. See a brief history of missile defense.